In late May, both Walmart and Target Corp. issued their quarterly performance numbers. Each revealed some surprises, and both left those retailing authorities who still retain some faith in the business a bit more optimistic than they had been. First, Walmart. Most surprising here was the revelation that the recent success of the retailer’s online business was neither wishful thinking nor unwarranted optimism. Walmart’s e-commerce business advanced by 63% in the United States in the latest quarter. Many reasons exist for this phenomenal increase, but perhaps the most important was the retailer’s purchase, for $3.3 billion, of the bulk e-commerce retailer Jet.com last year. That purchase sharply expanded its range of online offerings, now put at some 50 million items, up from 35 million in the last quarter and 10 million during last year’s first quarter. Other figures, though they were less remarkable, were nonetheless impressive. Same-store sales for the Walmart stores increased between 1.5% and 2%, while sales at the Sam’s Club outlets advanced by more than 1%. Wal­mart’s U.S. stores reached $75 billion in sales on a 2.9% comp-store increase. 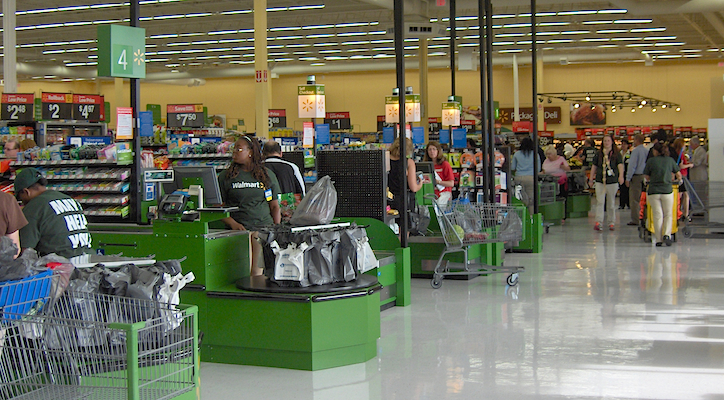 In terms of merchandise, the Walmart U.S. stores turned in respectable gains in most grocery categories last quarter, highlighted by a strong Easter performance. Health and wellness also performed well, highlighted by good gains in pharmacy and O-T-C categories. General merchandise sales were sluggish by comparison, though they improved throughout the quarter and finished with a strong Easter. Walmart International posted mixed results, though Walmex, the retailer’s Mexican and Central American operations, turned in strong sales, and sales in the U.K. and China ­declined marginally. As for Target, while no one number stood out, the retailer’s overall performance exceeded company projections. Most notably, first quarter same-store sales declined by 1.3%, driven by small declines in both traffic and basket size. The retailer’s earnings release emphasized that the 1.3% sales decline was “better than our expectations,” according to chief executive officer Brian Cornell. Elsewhere, Target reported a 22% increase in digital sales, a small decline in earnings, and a continued commitment to a multiyear effort to position the retailer for profitable, consistent long-term growth. Throughout, Cornell projected a tone of optimism as he stressed a future that, despite “multiple headwinds,” promises long-term success. No matter how you read these two financial statements, Walmart and Target remain what they have long been: two of the mass retailers that will largely determine the state of the industry in the years ahead. And the positive spin on the news was promising for a retailer community that has, in the main, viewed both these retailers as serious competitors. Serious or not, these two retailers, operating at their best, promise to raise all boats going forward.